Which of these items are recyclable? Find the answer at the end of the blog. Did you struggle a little? If you did, that’s okay! It’s really hard to know what is recyclable, especially if you don’t know where to look. The guidelines change from county to county—even neighboring Santa Barbara and San Luis Obispo Counties differ in what they accept—and even more so from state to state. What is recyclable in your county? It can be hard to figure out. A lot of this variation is due to the fact that there are no national recycling laws. It is up to state and local governments to implement recycling programs. Also, when it comes down to it, the recycling industry is a business. This is the major factor that affects what is considered recyclable in each area. To fully understand our recycling industry, we need to recognize that, until 2018, we sent most of our plastic waste to China. Since 1992, China has imported forty-five percent of all the plastic waste produced by the world. Those numbers began to decrease in 2017 after China passed the National Sword policy, which banned a huge amount of plastic intended for recycling from being imported. According to NPR, this policy will lead to 111 million metric tons of plastic waste getting displaced by 2030. That is about half of all the plastic waste imported globally since 1988! So, how did China become the main importer of plastic waste? China began to import huge amounts of plastic in the 1980s and 1990s. Having an abundance of cheap labor during those years allowed them to manufacture plastic containers, bottles, and other items from the plastic waste they bought from wealthier countries. This practice increased in 2001 when China became part of the World Trade Organization, which opened the doors to international business opportunities. 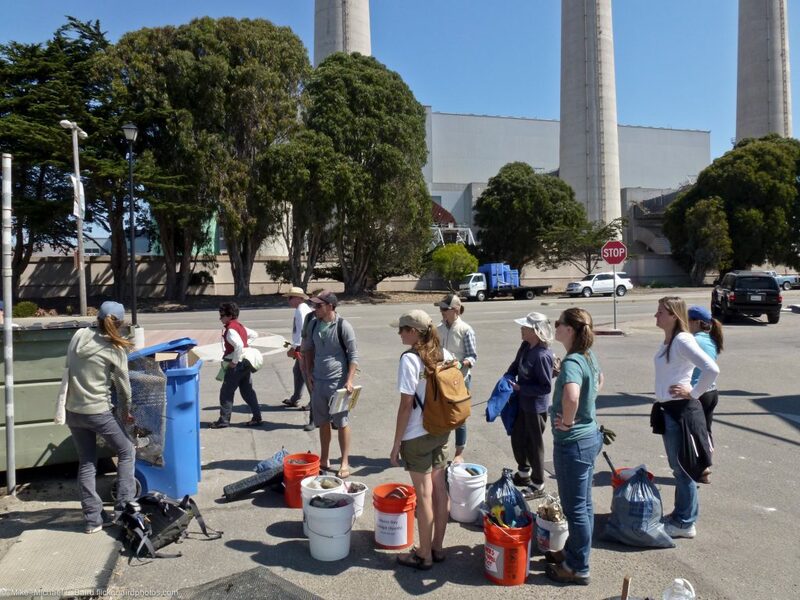 Volunteers sort recyclables after a beach cleanup. Due to the National Sword policy, California’s recycling businesses are struggling to cope with the amount of plastic waste produced by residents. Because China dealt with our plastic waste for so many years, we came to depend on them for this service. China even paid for our recyclables, which made the expensive prospect of developing plastic processing infrastructure here seem like a bad business decision. Now, though, this lack of infrastructure means that a lot of recyclable materials are being thrown in landfills in hopes of controlling the buildup of waste. In spite of this, Mike DiMilo of the Integrated Waste Management Authority (IWMA) doesn’t think we should see the ban as all bad. 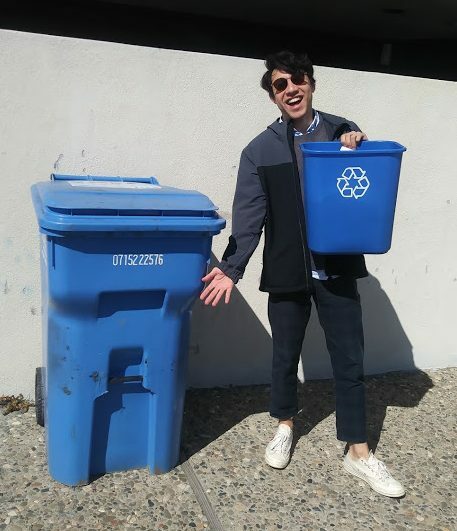 “In the long run, in my opinion,” he says, “it could be a good thing not relying on only one destination…it could help develop more domestic facilities.” Now that we are being forced to deal with our own plastics, it leaves room for us to grow in the recycling industry. Taking charge of our waste might even allow us to refocus on how much plastic we should be producing and using. 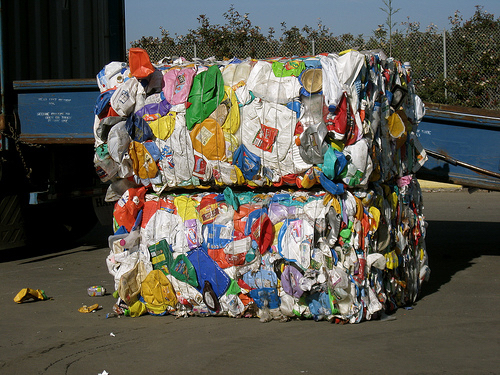 Plastic waste is compacted and bound together for transport. As community members we can help out our local recycling facility by educating ourselves on what is recyclable in our area. Material Recovery Facilities (often written as MRFs and pronounced “merfs”), are the places where all the recycling magic happens in the states. These facilities sort waste by type—aluminum, glass, different plastics, etc. Sorting entails several steps and uses a combination of human and machine methods to get the job done. This video illustrates how these MRFs work. 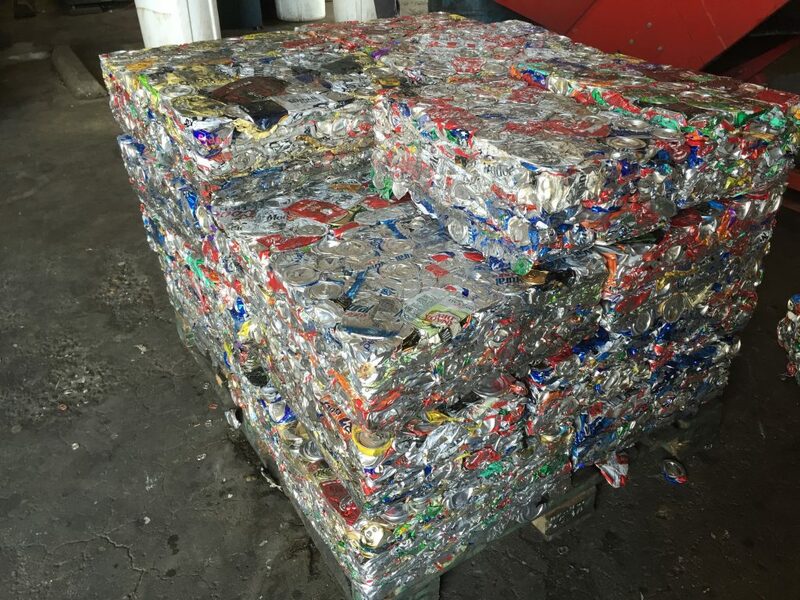 Aluminum cans are compacted and bound together for transport. This process of sorting different types of recycling is rigorous but effective. However, it has a big kryptonite: contamination. 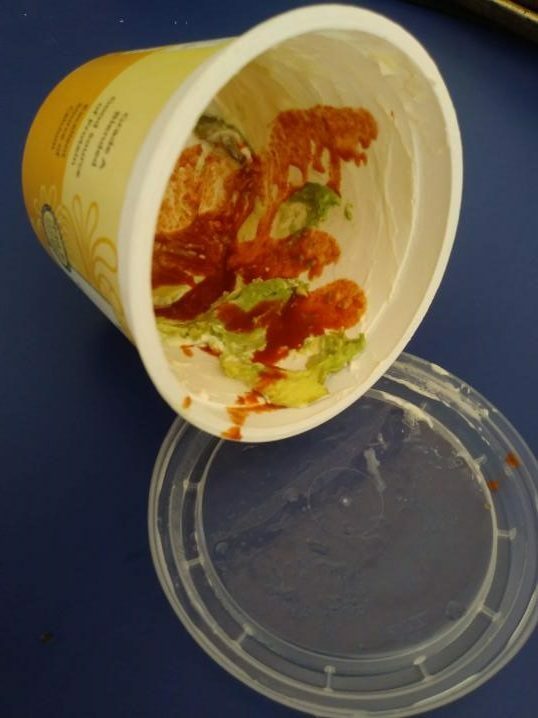 Contamination includes items that would be recyclable if they were clean, like a plastic container with food stuck inside, for example. Food soils the recyclable materials, making them impossible to reuse. Items that are not recyclable at the curb are also considered contaminates. The main contaminates that MRFs take in are batteries and plastic single-use bags. Mike DiMilo explains that the plastic bags that get sent to our local MRF clog the system, causing the facility to shut down and taking up to an hour to clean the clog out and restart the machines. Batteries cause problems because they are quite small and it can take a good chunk of time to locate and remove them from the massive sorting machines. How clean does our recycling need to be? Make sure to clean out your plastic containers before placing them into your recycling bin. According to IWMA’s website, make sure to clean and dry out your plastic containers before placing them in the recycling bin. If plastic has food contaminants, it will be separated out and sent to a landfill. For glass containers, make sure to rinse out any leftover liquids or food because they can contaminate other recyclables. Also, when you recycle glass containers, make sure to take off the lids before tossing both in the recycling bin. For answers to any other questions about recycling contamination, go to the IWMA’s website. What do you do with batteries if you can’t recycle them at the curb? In San Luis Obispo County, any business that sells single-use batteries, button batteries, rechargeable batteries, or other hazardous materials that can’t be disposed of at the curb, has to accept your item and recycle it free of charge. The list of materials that stores must take back includes CFLs, fluorescent tubes, mercury thermostats, paint, needles, sharps, and unwanted medication. You can find more information on the IWMA’s SLO Take Back Program page. The IWMA is a valuable resource here in San Luis Obispo County. Not only do they have plenty of valuable resources online, they also go out and teach the community about waste management. You can even have a member of the IWMA team come out and evaluate your workplace’s current waste-management practices and suggest ways to improve both food waste disposal and recycling programs. Contact . In general, the IWMA is there to answer your recycling questions. There is hope for our recycling industry, we just need the community to push it forward. The greatest tool we have is to educate ourselves and implement what we have learned. To start, visit the IMWA’s website and see what is recyclable in San Luis Obispo County. Want to test your recycling knowledge again? Here is another quiz! Scroll to the bottom of this post to see a list of works cited. This is the last weekend to see S.L.O.P.E.’s show Flowing Estuary to Living Sea, at the Morro Bay State Park Natural History Museum. On Saturday, March 30, you can even meet the Plein Air painters in person at the closing reception. Just stop by between 1:00 and 4:00 p.m. to say hello! The show closes on March 31, 2019. A portion of proceeds from art sales will benefit the Morro Bay National Estuary Program and the Central Coast State Parks Association. We hope to see you there! Albeck-ripka, Livia. “Your Recycling Gets Recycled, Right? Maybe, or Maybe Not.” The New York Times. May 29, 2018. Accessed March 22, 2019. https://www.nytimes.com/2018/05/29/climate/recycling-landfills-plastic-papers.html. “China Trash Ban Is a Global Recycling Wake up Call.” CNNMoney. Accessed March 22, 2019. https://money.cnn.com/2018/04/20/news/china-trash-recycling-environment/index.html. Mak, Aaron, “Why Does Half of the World’s Used Plastic End Up in China?” Slate Magazine. June 21, 2018. Accessed March 22, 2019. https://slate.com/technology/2018/06/why-china-import-half-world-used-plastic.html. Phillips, Erica E. “U.S. Recycling Companies Face Upheaval from China Scrap Ban.” The Wall Street Journal. August 02, 2018. Accessed March 22, 2019. https://www.wsj.com/articles/u-s-recycling-companies-face-upheaval-from-china-scrap-ban-1533231057. Rosengren, Cole. “Timeline: How China Has Reshaped US Recycling.” Waste Dive. July 18, 2018. Accessed March 22, 2019. https://www.wastedive.com/news/china-us-recycling-scrap-import-ban-trade-anniversary-2018/528050/. Rosengren, Cole. “How Recycling Is Changing in All 50 States.” Waste Dive. February 01, 2019. Accessed March 22, 2019. https://www.wastedive.com/news/what-chinese-import-policies-mean-for-all-50-states/510751/. Watson, Sara Kiley. “China Has Refused To Recycle The West’s Plastics. What Now?” NPR. June 28, 2018. Accessed March 22, 2019. https://www.npr.org/sections/goatsandsoda/2018/06/28/623972937/china-has-refused-to-recycle-the-wests-plastics-what-now.